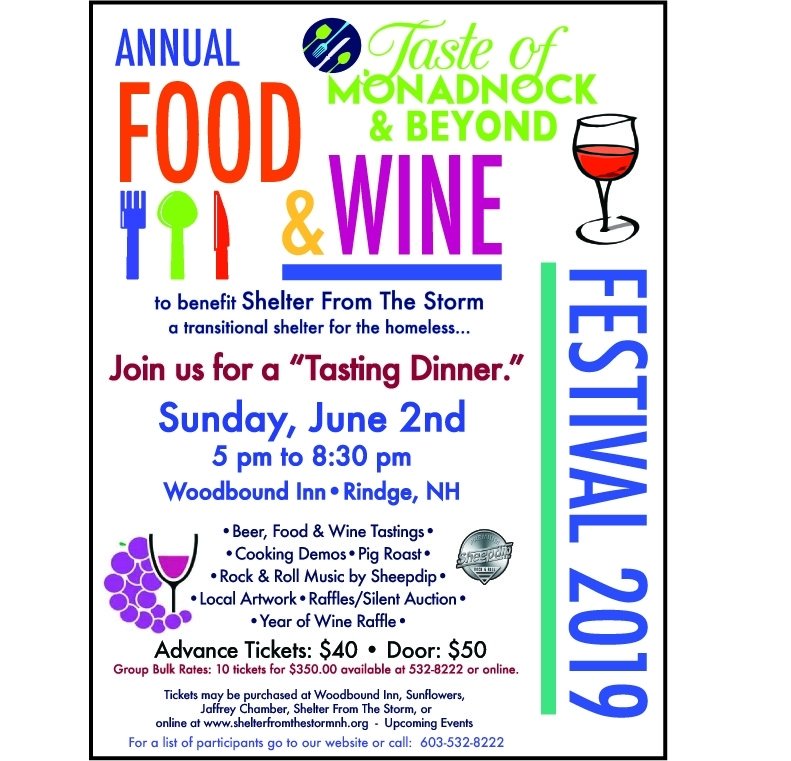 Description Shelter From The Storm will be holding their Fifth Annual TASTE OF MONADNOCK & BEYOND FOOD & WINE FESTIVAL at the WOODBOUND INN, Rindge, NH on Sunday, June 2nd from 5 to 8:30 pm. Rudy Rosalez has once again generously donated the use of his restaurant, playbarn, ballroom, and grounds for this event. All proceeds will help Shelter to fulfill their mission to provide transitional housing and support programs for the homeless. There will be live Rock & Roll music by Sheepdip with over 50 vendors participating, including well-known wineries, restaurants, local growers, brewers, cooking demos, local artwork, raffles, and much more. This year we will be raffling off “A Year of Wine” and a few more surprises! Have a “Tasting Dinner” with us. Enjoy the different specialties each restaurant has to offer, find a new restaurant or wine you might enjoy or a piece of art from the Monadnock region and Beyond. Add Taste of Monadnock & Beyond Food and Wine Festival to your free online travel itinerary.